i told you there were 3 big baby gear items that i was planning to redo for layla's infanthood, and i just know that wrapping up the series has been keeping you up nights. so here's the final installment: the moses basket! some of you may not be familiar with this little item (i sure wasn't until the knocked-uppage happened), but its a basket like a tiny, portable bassinet that the baby can nap in, or even use as his/her main sleeping chambers. 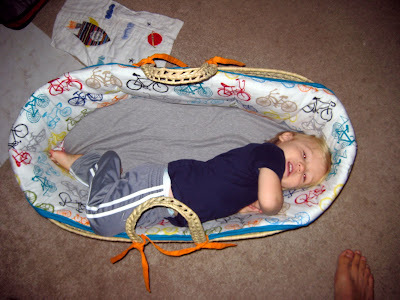 its smaller and cozier than a crib, which is more womblike, and of course you can move it all around the house with you throughout the day. the real moses' basket was actually made of papyrus and pitch, but target doesn't carry these more authentic models anymore it seems. judah never really got down on this too much. BUT this was before we realized what a little swaddle-holic he was, so i am betting if he had been swaddled in the basket, he would have loved it. as it was, he spent most of his first two months sleeping on one of our chests in our bed while the moses basket became a double occupancy cat bed. so all the embedded cat hair and dander even after multiple washings was enough of a reason to want to remake this. gagfest. judah also took naps in his real crib from a very young age and would even sleep nights in his room because jesse is such an amazing husband and would go and get him and bring him to me in bed for every, single night feeding. 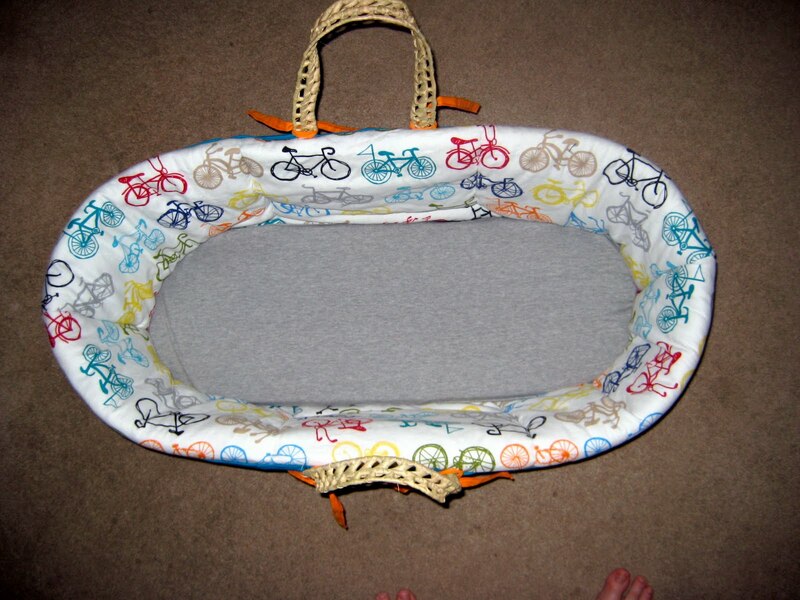 but since we don't have a crib or a room for the boo right now, the moses basket WILL be employed. 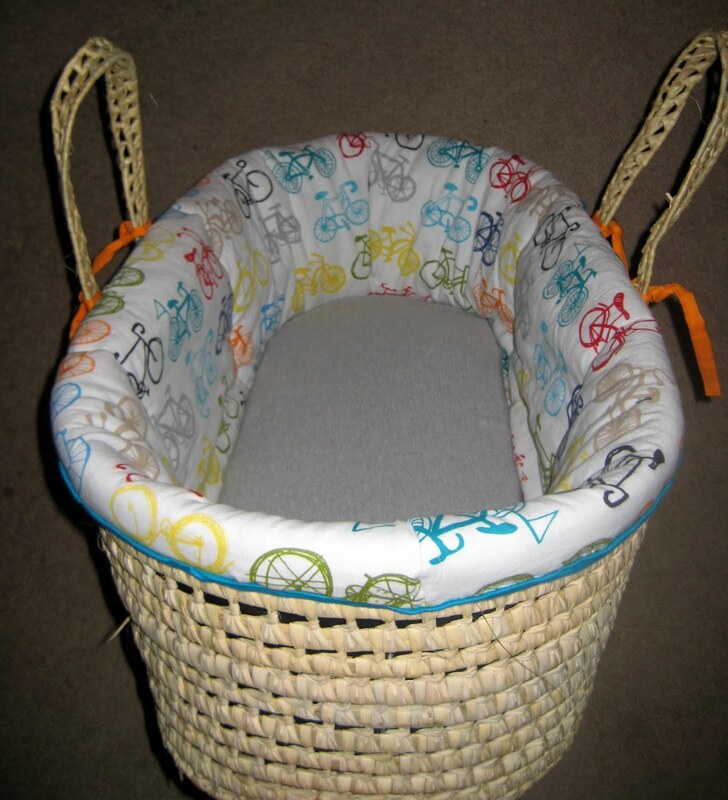 here is the basket and the bedding we bought for judah. none of the color/fabric choices were particularly exciting, and we just went with red because it matched our room and our bedding pretty well. you know, to impress all the people who come over to judge whether or not your baby gear matches the rest of your house when you have a newborn. totally shmeh, right? yeah, it's snooze-o-rama, and i am really not down with the sweater material. 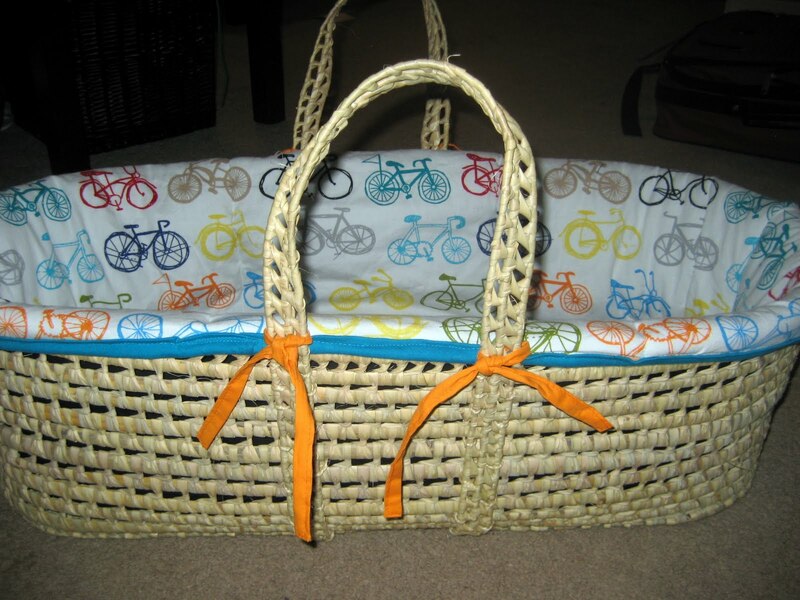 also, ours actually didn't have those ties, instead it had a slot that each basket handle threaded through. but when i went to find this picture on the target site and saw that they now come with ties, i decided to use that idea for my new cover. 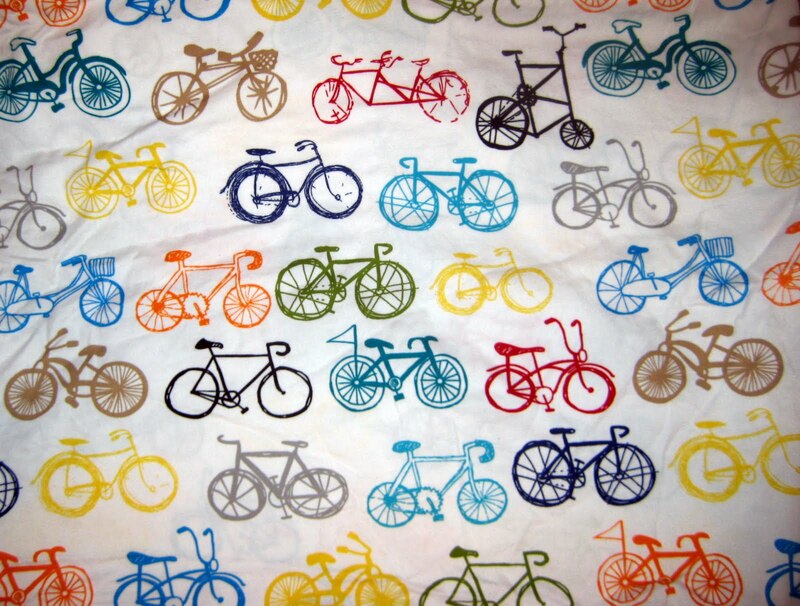 so i found this squeal-inducing fabric a few weeks ago and have been dying to use it for something. but i didn't want to waste it on just any project or a piece of clothing that one of the kids would grow out of really fast. 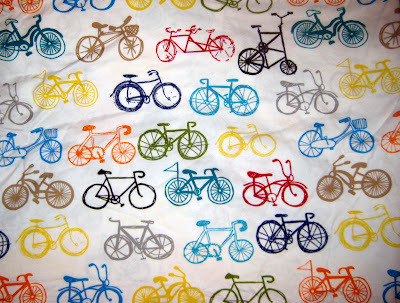 it's all different models of sketched bicycles in tons of fun bright colors and it makes me happy just to look at it. what makes this fabric even cooler is that probably very few people have it because of how i obtained it. because i am thrifty like that, i go to target and look in their clearance sheets section because you can get yards of fabric out of even a twin sheet set for about $3. the bikes were actually body pillow covers and i bought both of the ones that were there for $2.50 each. and they are so very soft. i don't think it's a jersey knit because it comes apart like a woven, but it feels just like a t-shirt. so in love. and the body pillow dimensions actually worked well for this project since the basket bedding needed to be really wide and really short too. less waste. i actually only had to use one of the pillowcases so i have a whole intact one to use on future stuff, in case you want me to make you a unitard out of this bliss. i destroyed the old cover stitch by stitch and used it as a pattern for the new one. this project didn't require hardly any thought, but was time consuming just because the pieces were so large and long. i made the fitted sheet that goes over the mattress pad a soft gray jersey (there is a gray bike that it matches). i actually made it a little too loose, so i am gonna take that in some, but i also plan to make a few more sheets in different colors so that i have backups on hand for those inevitable newborn blowouts (they're messy, but they smell like honey nut cheerios, so there's a silver lining. if judah had a blowout these days, we'd probably just abandon the house rather than attempt to clean it up or go near that stank). one more view of the snuggle-dome. so nope, it's not girlie at all, but it is fun and colorful and i just love it. especially after my fabric doubts on the last project. 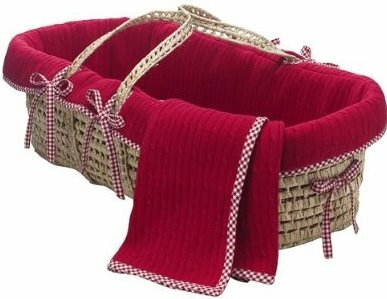 i think if pharoah's daughter found this basket floating down nile with baby moses in it, she totally would have had it dry cleaned and kept it for his official bedding. looks like judah and daddy had some fun this morning with the camera and the moses basket before i woke up. what an AWESOME surprise to find at the end of this roll of film (yes we have a digital camera, but i don't know how else to say it, "at the end of the datacard?") the little monster has messed up the bumper and is way to huge to be in there, but holy cow, so worth it. the funny thing is that he has had a blast playing with all three of the baby items i redid: the boppy (he loves trying to walk on and fall off of unstable surfaces), the carseat (this became his lazy boy recliner that he would sit in like a fat man and watch elmo) and now the moses basket (which i am guessing that daddy actually tossed him in). i hope layla is down with sharing. super cute!! you amaze me as usual! We actually were doing the centrifuge with it. And he was being so cute just laying in it peacefully until I got the camera out... Naturally. And who is supposed to get over themselves? Lena? K8? Judah? I'm so confused. super cute. how did you get his blow outs to smell like honey nut cheerios?? Our are nasty. OMG, I was joking... K8's crafting skillz are amazingly ridiculous!!! 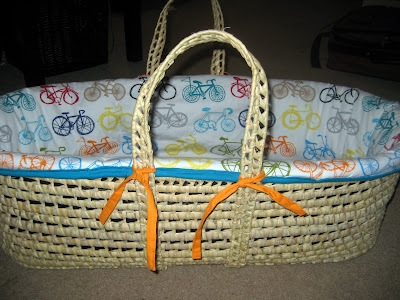 I can't wait to see the babe in the basket and carseat and clothing and leg warmers, etc. What did Lena say?